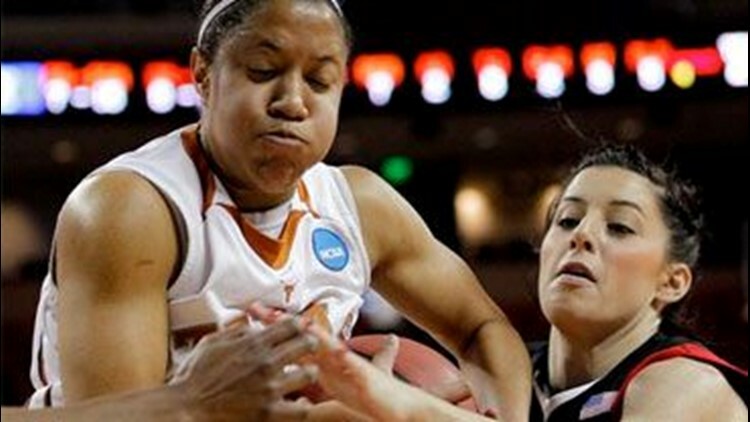 AUSTIN, Texas (AP) — San Diego State knew it had the speed and athleticism at guard to torment Texas all night. But even the Aztecs had to be surprised at how efficiently they dismantled the Longhorns in front of their home fans. Jene Morris scored 32 points and the No. 11 -seed Aztecs stunned the sixth-seeded Longhorns 74-63 on Texas' home court Sunday night in the first round of the Memphis Regional. Coco Davis and Quenese Davis were equally devastating in breaking down the Texas defense, often leaving the Longhorns flat-footed on the dribble or flailing to reach long passes in transition. "I just think we came in confident," Morris said. "When you play a program like Texas, that's what you have to do. Confidence and working together was key tonight." It was the second year in a row San Diego State has pulled off a first-round upset. The Aztecs were a No. 10 seed when they beat No. 7 DePaul last season. San Diego State plays the winner of Sunday night's matchup between No. 3 West Virginia (28-5) and No. 14 Lamar (26-7) on Tuesday night. Freshman center Cokie Reed scored 16 for Texas (22-11), which missed at least half a dozen open layups in shooting 33 percent. The Longhorns also went 1 of 13 from 3-point range. The loss is a crushing blow for a Texas program trying to return to elite status. The Longhorns are 1-3 in the NCAA tournament in three years under Goestenkors, who was hired away from Duke where she had built the Blue Devils into a perennial Final Four team. And considering their history at home, Texas seemed like a lock to advance. The Longhorns were 6-1 in NCAA games they hosted and just like those, this one was in front of several thousands fans wearing burnt orange. "We felt like we let them down," Texas' Kathleen Nash said. "You work all year long and have expectations and it all comes down to this." San Diego State certainly wasn't intimidated. The Aztecs had knocked off then-No. 4 Texas in a holiday tournament last season and came into this game bolstered with the confidence of winning the Mountain West tournament to earn their NCAA bid. "I've been telling my team the past eight days that the pressure is on them," San Diego State Beth Burns said. "When you're playing at home, there's a whole other dynamic of surviving and advancing." With no more than two dozen fans cheering them, San Diego State raced to 33-14 lead. Morris and Coco Davis set the pace right away. They combined to hit six 3-pointers in the opening run. "We couldn't do anything with (Morris). She pretty much had her way with us," Goestenkors said. Texas regrouped to get within 33-27. San Diego State quickly answered another run. On one play, Jessika Bradley ripped down a rebound and fired a quick pass to Quenese Davis who lobbed it to Coco Davis for an easy fast break layup. After three wild swings in momentum, San Diego State led 44-30 at halftime. Texas twice cut the lead under 10 in the first four minutes of the second before Morris swished another 3-pointer and Ashley Duffy made a long jumper from the left wing. Texas made its final push when Reed banked home a layup to pull the Longhorns within 63-54, then made two more shots. But the Aztecs came up with a huge defensive play to snuff it out. Bradley, playing with four fouls, blocked a shot by Ashleigh Fontenette, then made two free throws five seconds later to push the lead back to 10 with 1:41 to play.